Two men were killed in a fiery single-vehicle crash on the Chinatown feeder ramp from the inbound Dan Ryan Expressway on Chicago's South Side. 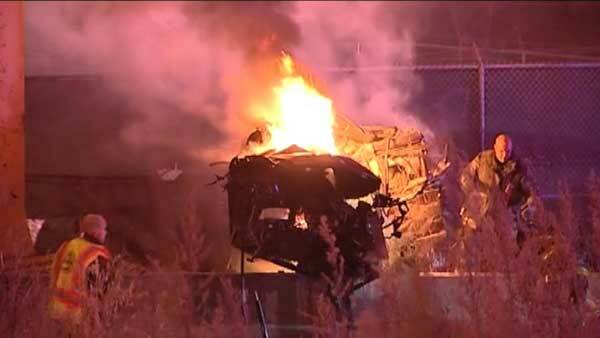 CHICAGO (WLS) -- Two men were killed in a fiery single-vehicle crash on the Chinatown feeder ramp from the inbound Dan Ryan Expressway on Chicago's South Side. Illinois State Police said a car was speeding when it crashed into a wall just after 11:20 p.m. Tuesday. The vehicle caught fire and was fully engulfed by flames. Both men were extricated from the car. State police said they were pronounced dead at the scene. The victims have not been identified. Investigators closed the ramp for several hours overnight. It re-opened just before 5 a.m. Wednesday.